Rarely does a person reach adulthood without possessing a scar or two somewhere on the body. Most of us have scars we obtained from enduring the normal scrapes and falls of childhood, scars that are so small and insignificant no one else knows we even have them. But when unsightly scars due to severe acne, major surgery, burns and pregnancy cover areas of the body that are clearly visible to others, they can make us feel self-conscious, unattractive and prevent us from wearing different types of clothing. In addition, some larger, thicker scars may inhibit movement depending on where they are located or suffer frequent infection. 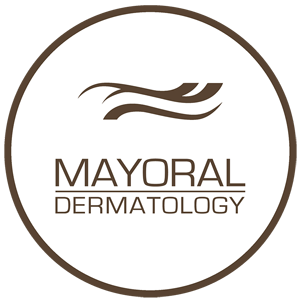 Mayoral Dermatology specializes in diminishing the pronounced appearance of scars with state of the art techniques involving laser therapy, microdermabrasion and superior exfoliation procedures. Patients desiring scar reduction services will be happy to know that these techniques are non-invasive, do not require general anesthesia and will not cause patients to suffer through long recovery times. In addition, our scar reduction services can help return the natural tone of your skin to a scar that is noticeably discolored. The inferior quality of scars in comparison to normal skin makes areas of scarring more vulnerable to the damaging effects of UV rays. In addition, hair follicles and sweat glands are permanently destroyed by overproduction of collagen and their abnormal fiber structuring during the healing process. Scars are often lighter than the skin’s natural tone, often whitish or silvery in color due to insufficient blood flow to the area as well. If epithelial tissue covers wounds within two weeks, scars generally do not form because of insufficient amounts of collagen. Wounds that cannot heal within that time usually develop into scars. Stretch marks, or “scars” that appear on a woman’s abdomen following pregnancy, are not classic scars because the epidermis is not broken and collagen is not involved in the process of creating stretch marks. Instead, damage to dermal elastin fibers produce the reddish or silvery streaks due to intense stretching of elastin in the skin of the abdomen. Additionally, hormonal changes can also contribute to the severity or lack of stretch marks in women. Scars will not form until a wound has healed completely To help reduce the chance of a scar forming, avoid exposing the wound to direct sunlight, irritating soaps containing perfumes or foaming agents or peroxide and alcohol. Scars are initially red or pink in color because of cells called cytokines that secrete chemicals to facilitate inflammation. Once the immune system detects injury, it floods the inflamed area with white blood cells to initiate healing. Scars that are elevated above skin level are called hypertrophic scars. An overproduction of collagen created raised scars usually red in color and developing within four to eight weeks of the wound injuring the skin. These scars may contain blood vessels and commonly follow burns or laceration involving deeper layers of the skin where a protein called transforming growth factor exists in high levels and controls cellular differentiation and cell reproduction. Some hypertrophic scars may itch intensely or become painful as they thicken over the course of several months. If situated on or close to a joint, they may be eventually increase in density enough to restrict movement. A more severe type of hypertrophic scarring, keloid scars do not stop growing and often develop into benign neoplasms, or abnormal tissue mass produced by accelerated cell production. Unlike hypertrophic scars, keloid scars extend outside the periphery of the wound and are commonly the result of surgery, severe acne, traumatic wounds and occasionally body piercings. In addition to being itchy and sometimes painful, keloids are known to emerge spontaneously in people who are genetically predisposed to keloid formation. Many times these keloids grow so large they require surgical excision for removal. Instead of rising above skin level, atrophic scars “sink” into the skin to form a recess or pit because supporting structures such as muscle or fat have been lost in the process of healing. Typically, atrophic scars are seen following severe cases of chickenpox or acne. To improve scarring, improve your skin’s texture and replace discoloration with natural skin tone, Pixel® Fractional Skin Resurfacing uses the concept of microthermal treatment zones that targets tiny, pixel-sized areas with a high intensity light beam leaving tissues outside the zones untouched. This allows the untreated areas to facilitate rapid and effective healing of tissues that have been treated with this innovative resurfacing technique. As the laser gently and painlessly removes the upper dermis and epidermis, a fresh, new layer of smoother, unscarred skin is revealed, diminishing not only scars by any wrinkling or fine lines associated with the scar. Photodynamic Therapy (PDT), is a laser treatment that has a proven track record of success in treating scars. Often used on severe acne scarring, it reduces scarring while also leaving the skin looking and feeling younger. Sessions are typically not longer than 15 minutes and have require absolutely no downtime. However, exposure to the sun must be restricted over a period of 48 hours. As a state of the art skin revitalizing and exfoliation scar reduction system, the DermaSweep™MD uses a wand tip that acts like a gentle but powerful vacuum to gently remove the skin’s topmost layer. This action leaves skin smoother, reduces the thickness of raised scars and stimulates blood flow to promote a healthier, natural tone where discoloration previously existed. While undergoing scar removal using DermaSweep, patients will also experience the additional benefits of deep pore cleansing and firming of the epidermis. If you are bothered by unsightly scars, why not visit Mayoral Dermatology and talk to one of our specialists who will glad to discuss treatment options involving removal of atrophic, hypertrophic or keloid scars.